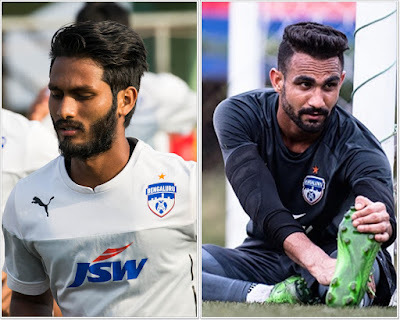 Bengaluru FC, on Thursday, announced that goalkeeper Amrinder Singh and Alwyn George had signed new one-year deals, which would keep them with the Blues until the end of the 2016-17 season. Amrinder, having joined Bengaluru at the beginning of 2016, makes his loan move from Pune FC permanent while the club has opted to activate the one-year extension clause on Alwyn’s contract. Club COO Mustafa Ghouse said the club is delighted to have re-signed the duo, who he believes are an integral part of the Blues’ squad. “Amrinder has been one of the standout performers at the club this season. He had to fight for this place in the squad and once he got it, he held on to it with a string of good performances. Everyone knows what a valuable signing he’s been and we’re excited to have him with us. As for Alwyn, we all know what a talent he is. He came into his own as the season progressed and we strongly believe he is one for the future and are very happy to activate the plus-one clause on his contract,” said club COO Mustafa Ghouse.